Be a part of our 60th season. There’s a way for everyone to be involved with our season this year. 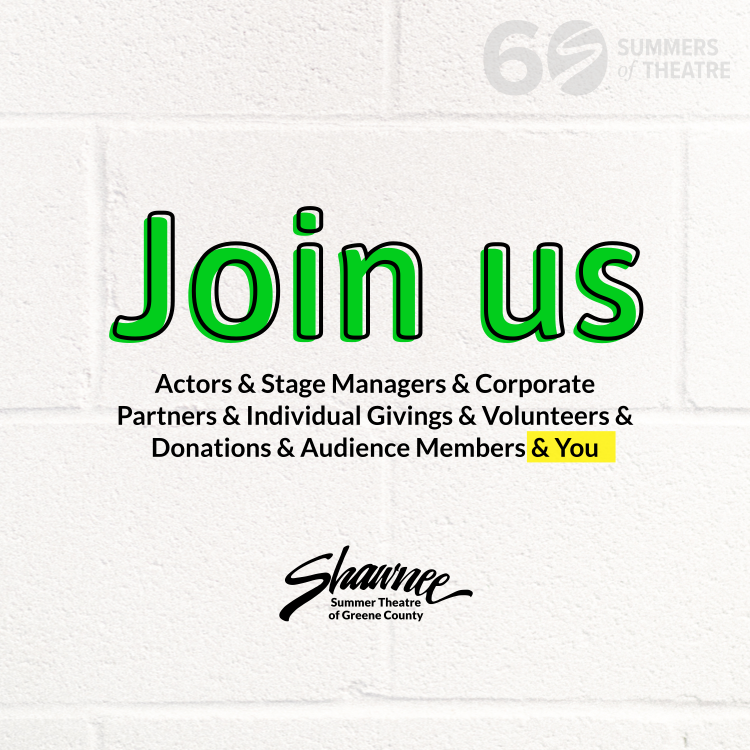 Whether it’s acting in a show or becoming a corporate partner or volunteering, read on for opportunities to be a part of the Shawnee this year. Actors, lights designers, stage managers, costume designers, sound engineers, scenic designers, directors and more from around the country spend their summers at the Shawnee Theatre. Be a part of our 60th season. We rely on the generosity of local, regional and national partners to continue to produce first-rate theatre for the Greene County community each year. A corporate partnership is the best way for your business to support the arts and the theatre, while gaining exposure with our audience. The Shawnee Theatre is incredibly grateful for the generosity of our dedicated donors. Ticket sales account for only a percentage of our income, and we rely on grants, sponsorships, and individual donations to provide the rest, allowing us to continue in our mission to provide quality theatre. Our audience is the backbone of the theatre, and we are pleased to offer them exclusive benefits like reserved seating and advance access to special events for our donors. New for 2019, Shawnee Theatre signage is going digital! Make a splash by advertising with prominent placement in our theatre auditorium. Your ad will play on a video loop during pre-show, intermission, and post-show. Reach a captive audience with exposure to over 5,000 people each summer. We guarantee a minimum of 1 minute of play time per performance (based on 10-15 second ad); 10 minutes for the run of a show; and 60 minutes over the course of the full season! A great way to give to Shawnee Theatre in-kind gifts or services. If you are an individual or business that would like to support us with an In-Kind Donation, please contact us. There is always a way to get involved with the Shawnee Theatre. As long as you have a heart for our community, you’re exactly the person we’re looking for!